January Journal: Day 31 — Ginger writes. 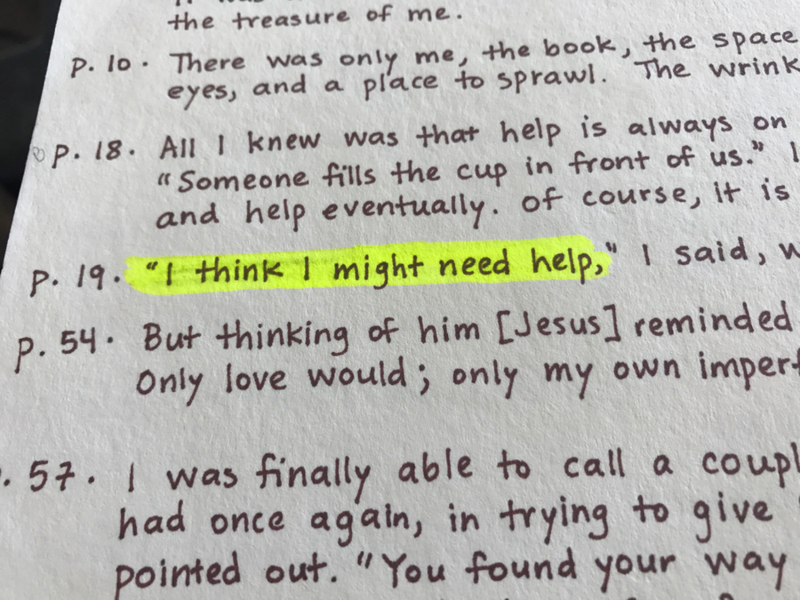 "I think I might need help," I said, which is something I force myself to say every few years. Thank you, Anne Lamott, for helping us by needing help yourself. The last time I saw a therapist was several years ago when we lived in Illinois. So we are to the "every few years" point again; hence, a week ago, I met with my new counselor for the first time. Partway through our meeting, I handed the counselor my page of quotes I had copied down and brought along for the purpose of letting people wiser than me tell her what my issues are. Then she told me she was an English major in college, which meant she "got" why I would share quotes. Bonus points, on top of the fact that I was already liking her. How is it possible after only one meeting that I feel hopeful she can help me? Jesus was a one-meeting kind of person too. Although she is a Christian counselor (which was important to me), she said she wants to try to keep the sin lens to the side and approach my issues more clinically. She said something to the effect that overspiritualizing the addiction and control issues usually tends to cause more shame in the broken person. She and I both know there is probably sin involved in not fully surrendering certain areas of my life to the Lord, but knowing that "sin" won't be our starting place made me feel a different kind of grace and freedom, which is what I think the Lord wants. Yes, of course, he wants no sin, but what if the way out is by submitting myself first to this professional, clinical expertise and by allowing myself to be helped, with the hope of truly being free to live as the new creation in Christ into which I've been invited? The counselor also talked about using the words “resistance” and “motivation," that these are words I can use to let her know how I’m feeling about things she asks me to do. I told her I didn’t want her to touch the food part of my life just yet, and obviously that’s resistance. As with any first meeting, we barely got started, but I already want to be her friend. That's not why I'll go back, though. I also won't go to just "be a little happier," which is what she said many people come to counseling for, as opposed to the few who see her who are truly ready to be free. I think that's me. I want that to be me. It's time to do what our pastor said Zacchaeus did after his encounter with Jesus. He finally found himself willing to kill what was killing him. I know it's not as easy as I made that sound. Killing hurts. So until more is revealed, I'll take it one baby step at the time, one appointment at the time, one assignment at the time. The only thing I'm to do for my next session is come unprepared. Literally. The counselor said she doesn't want me to think in advance of what I'm going to say next time. She wants our meeting to be a safe space, a place where I can share what comes to mind and can be free from figuring and planning. That's just what I needed someone to tell me.